The rightwing Christian president of the United States of America – Harry Truman – was a rabid anti-communist, and despite its 30 million war-dead, hated the USSR with a vengeance. Truman and his administration wanted to send a clear message to the struggling people of the Soviet Union that the cordial relationship between their two nations was well and truly over. The terror weapon of the atom bomb had been developed under Roosevelt as a possible answer to the war in Europe with the intention that it could be dropped on Nazi Germany as a means to shorten the war. Truman, however, decided that despite the continued threat the Nazi regime represented to allied troops, a non-European target was preferred. Hiroshima is a city in south-western Japan, on the southern coast of the island of Honshu. 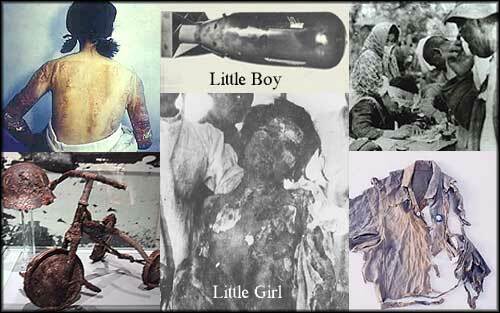 It was the designated target of the first US atomic bomb (the sinisterly ‘Little Boy’), which was dropped by the US Airforce on August 6, 1945, and resulted in the deaths of about 160,000 of the city’s population of 300,000. Truman proceeded with a second atomic bomb attack on the city of Nagasaki three days later (the so-called bomb named ‘Fat Man’), which killed around 80,000 people in just a few seconds, and planned to bomb Tokyo and elsewhere should the Japanese authorities not conform to expected Eurocentric modes of behaviour to signify the end of hostilities. The message of US imperialism is clear – the lives of (white) Europeans are inherently more important than those of non-Europeans, an openly racist motif that continues to form the ideological underpinnings of US aggression around the world today, and serves to explain its unflinching support for the terrorist state of modern Israel and its fascist philosophy of Zionism.